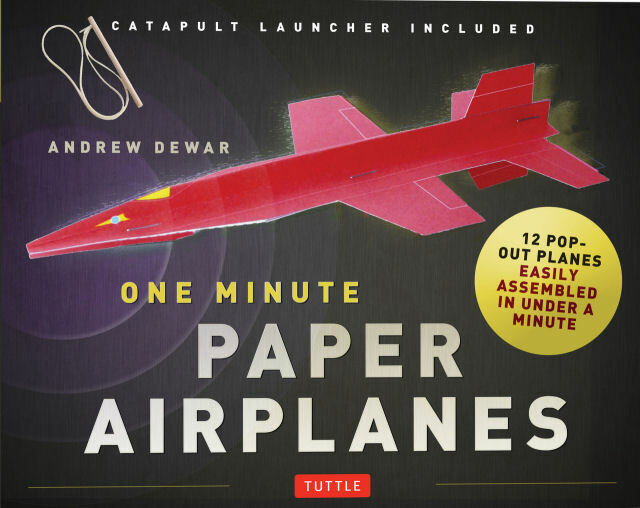 This book and kit includes a book which has a good amount of information about making and launching paper airplanes, how to trouble shoot to get them to fly well and a bit about the dynamics of gliding flight in a fun way. The include planes are printed in bright, smooth color on lightweight card stock, and can be popped out easily. They are not pre-scored, so you'll have to fold them yourself. Following the instructions in the book it's very easy. The book recommends using a ruler to fold, and I used a thin metal ruler and it made the straight folds. After doing the folds, I burnished them with a craft stick for very sharp folds, some parts are multilayered. There was an issue on the punch out of one of them where not all of the little V shaped areas to create the launching groove were punched, but a quick nip with small scissors fixed that. You can use either a stapler or glue to assemble them, but they are designed to be assembled using a stapler. Little lines indicate where the staples go. The planes are all different shapes and themes. Some are very simple, some are a bit more complicated and might take longer than a minute to make. The big fun is in launching them. All the planes are designed to be launched using a rubber band launcher. You give the plane a light test throw which won't send it more than 10 feet to see if you need to adjust anything- tips in the book tell you how to adjust for drag and various other issues. After you have it ready, take it somewhere you have room and let it fly with the launcher! So it's a bit of education, and a lot of fun. You get to make the planes, and some people will be inspired to design their own after trying the planes in the book. Then you get to launch them and see how far the different models fly and how well they fly. My son and I had a lot of fun making and launching planes. It's a fun paper craft kit, the planes are well-designed for flight and appearance with a bold graphic appeal. Like Tuttle Publishing on Facebook to find out about their other books.